Clark Hoyt � RoseHill Cemetery Foreman � Spearfish, SD. I am researching the life and career of Peter O'Hara who emigrated from Greenore, Ireland in 1915 and settled I think in the New York area. I have found some info in the NY Times archives on the web about his career in US. I believe he married and I would like to hear from any who may have known Peter. 550. William Alexander ("Bill") O'Hara (1883-1931) - Canadian Baseball Hall of Famer, well not yet!!! 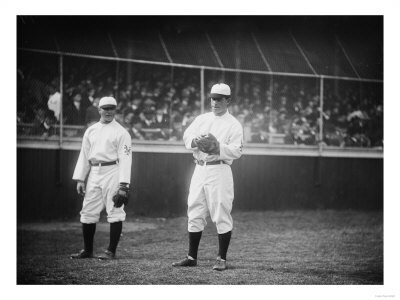 1909/10 the show with New York Giants and St. Louis Cardinals... Mgr. Johm McGraw says: " as a major league outfielder, there was no superior outfielder..". 1931 dies on road trip to New Jersey . William Alexander O'Hara qualifies for induction into the "Hall" in all categories..... builder, player and manager as well as war hero... he came back from WWI and Battle of Ypres shellshocked... could he have been gassed at Ypres, Willie served in 24 th battalion C.E.F after starting in Royal Naval Air service as flight lieut ... he also hung out with the artists and empresarios of Braodway. In 1909... George M Cohan was a close bud.... he was a mad Irish comedian.... certainly no Blarney transplant need for him!! PS. These 2 photos (tif-format) are from the Toronto archives. This is of him and Ty Cobb! Looks like an All-star type game but I�m not sure if they had that back then. I forget the year, it was Ty Cobb�s last year that he played I believe. Thereafter to the Number 7 restaurant at Celtic Park for a festive meal and entertainment. Ticket donations for the function are �20 and �10 for students and pensioners. It was Charles O'Hara who handed over the sword of surrender to Washington, the second in command, at Yorktown; he also had occasion to surrender to Napoleon. He is not proud of this fact but there is little he can do about it now. It was a sergeant Miles O'Hara who was the first cavalry man to die at Little Big Horn and it was Theodore O'Hara who wrote the immortal lines �On games eternal camping ground their lonely tents are spread And glory guards with solemn round the bivowac of the dead�. Bivoac of the dead is on tens of thousands of headstones and memorials. There is also a battleship called the General James O'Hara. My people come from Glenhest, Co Mayo. Webmaster's note: See British Soldiers and American Soldiers at this site!